A dying god, or departure of the gods, is a motif in mythology in which one or more gods (of a pantheon) die, are destroyed, or depart permanently from their place on Earth to elsewhere. Frequently cited examples of dying gods are Balder in Norse mythology, or Quetzalcoatl in Aztec mythology. 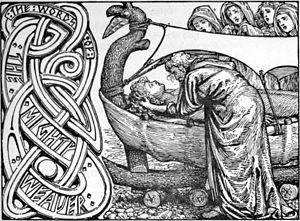 A special subcategory is the death of an entire pantheon, the most notable example being Ragnarök in Norse mythology, or Cronus and the Titans from Greek mythology, with other examples from Ireland, India, Hawaii and Tahiti. A192.2.1. Deity departs for heaven (skies). A192.2.1.1. Deity departs for moon. A192.2.2. Divinity departs in boat over sea. A192.2.3. Divinity departs to submarine home. A192.2.4. Divinity departs in column of flame. A192.3. Expected return of deity. A separate (although related and overlapping) category are gods who die and are also resurrected (Thompson's motif A193), see Dying-and-rising god. ^ a b S. Thompson, Motif-index of folk-literature : a classification of narrative elements in folktales, ballads, myths, fables, medieval romances, exempla, fabliaux, jest-books, and local legends, Revised and enlarged. edition. Bloomington : Indiana University Press, 1955-1958, p. 106. Burkert, Walter 1979. Structure and History in Greek Mythology and Ritual. London: University of California Press. Stookey, Lorena Laura. 2004. Thematic Guide to World Mythology. Westport: Greenwood. This page was last edited on 9 January 2019, at 19:37 (UTC).